Investment in rural infrastructure and manufacturing, increased outlays for railways and affordable housing push will boost domestic steel demand. Steel stocks can prove valuable long-term bets due to the growth prospects of the domestic steel sector. The global steel sector is facing challenges due to the recent correction in steel prices. Concerns of slowdown in the Chinese economy and oversupply by Chinese steel firms has brought down prices. Analysts are concerned that such volatility will affect the margins of Indian steel players in the short run. However, India’s steel demand continues to remain strong with 8.4% and 10.7% year-on-year (y-o-y) growth in October and November 2018, respectively. Strong demand has made India a net importer of steel—imports jumped 12% y-o-y, whereas exports fell 42% y-o-y in November 2018. According to a report by SBICap Securities, the domestic steel demand is likely to remain strong due to the election-fuelled infrastructure spending and approaching peak season. Some steel players believe that the current weakness in price, led by China, is temporary and seasonal and there is a strong likelihood of revival in steel prices in January-February 2019 due to rebound in restocking demand, ahead of the Chinese new year holidays. Bloomberg Intelligence is bullish on the long-term prospects of the steel sector and believes that India’s steel consumption will accelerate as the country invests in rural infrastructure and manufacturing. According to the steel ministry, the demand is set to increase at 6.5% CAGR between 2017 and 2031. Increased outlays for the railways sector, government’s affordable housing push, and rising demand in capital goods and consumer durables will further boost domestic steel industry’s growth. 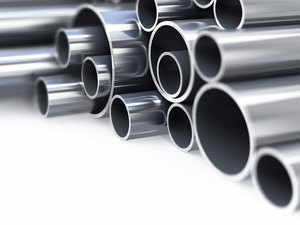 Valuation of most global steel players have contracted due to a subdued economic outlook and this could impact the prices of domestic steel stocks over the short- to medium-term. However, steel stocks can prove valuable long-term bets due to the growth prospects of the domestic steel sector. Let us look at the four major Indian steel companies. Of the 99 recommendations by Bloomberg analysts on these stocks, 64% are buy, 17% are hold and 19% are sell. The company has a presence in steel, power, mining and infrastructure sectors. According to SBICap Securities, robust domestic steel outlook, ramp-up of steel business and depreciating rupee will help sustain its margins and profitability going forward. The brokerage believes that the company is on a sustainable path towards deleveraging and is a re-rating candidate. According to Bloomberg consensus estimates, the company’s 2018-19 revenue and net profit growth, y-o-y, will be 40.5% and 88.7%, respectively. Tata steel’s operations range from mining to manufacturing and marketing of finished steel products. Bloomberg Intelligence believes that its revenue will keep growing due to robust domestic demand—it accounted for more than 50% of the company’s revenue in the first half of 2018-19. According to JP Morgan, Tata Steel is wellpositioned to generate profit, given its raw material security and exposure to value-added business segments. According to Bloomberg consensus estimates, it’s net profit will grow 52.2%, y-o-y, in 2018-19. This is a government-owned steel manufacturing company and enjoys Maharatna status. Brokerage house JP Morgan is concerned about wage renegotiations in the company that may hurt its profitability. The brokerage believes that SAIL offers an attractive volume story in the tight steel market, but will wait for margin to rise and cash flows to translate into lower debt. According to Bloomberg consensus estimates, the company will deliver revenue growth of 23.2%, y-o-y, in 2018-19. The company produces value-added and high-grade steel products and exports them to more than 100 countries. According to a report by JM Financial, sustained steel realisation, moderation in raw material price and lower conversion cost compared to peers augurs well for the company’s earnings trajectory. Recent acquisitions and planned capex over the next three years will also aid growth. According to Bloomberg consensus estimates, the company’s net profit will grow 29.4%, y-oy, in 2018-19. ROE: Return on equity. EV: Enterprise value. Ebitda: Earnings before interest, tax, depreciation and amortisation. Current prices as on 2 Jan 2019. Source: ACE Equity and Bloomberg.